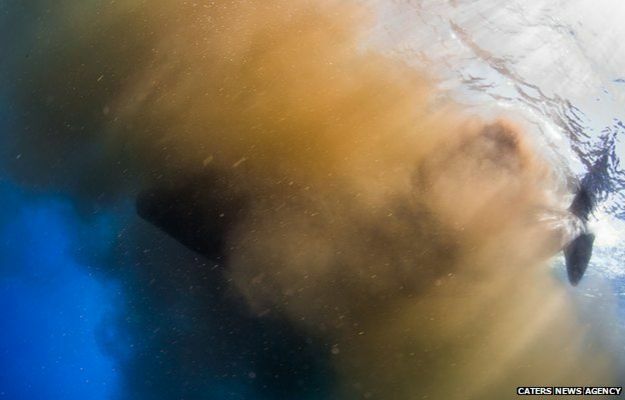 Underwater photographers caught in sperm whale Poopnado! Sometimes I want to explore the world more, like taking photos underwater…Then there are moments like these where I’m reminded how…Its best to just stay inside. When Keri Wilk dived into clear waters off the island of Dominica, swimming through a massive whale poo was not in the plan. But it’s what happened. “At first, it seemed like a regular bowel movement,” Keri explained…”But rather than continuing its dive down, it remained at the surface and continued to defecate for a startling length of time. The “poonado” then spread through the water – ending up in Keri’s mouth – as the whale flapped its tail. Keri said the poo ended up spreading about 30 metres around him and his three fellow divers.